My partner and I and our two dogs are big fans of UK holidays: Hiring a cottage in a pretty area of the country and spending a week relaxing, walking, cooking and eating. 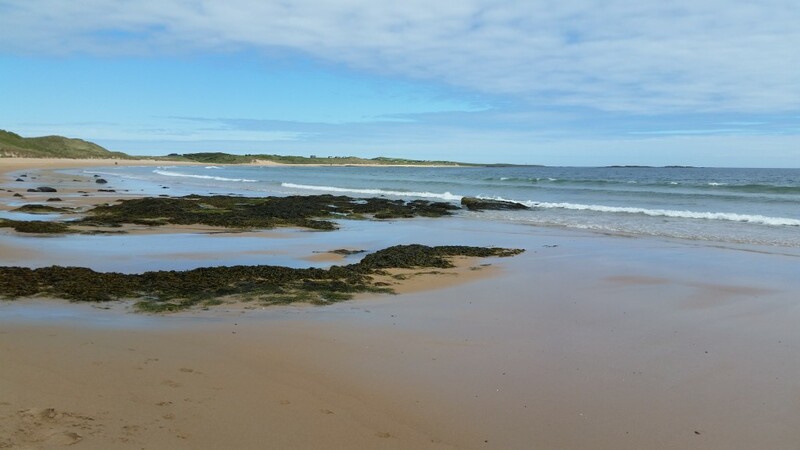 This week we’re staying in the village of Lesbury just north of Alnwick, close to the beautiful Northumberland coast. I love it up here because it’s so quiet. It’s a land of big skies, amazing castles and quiet beaches – and it’s fantastically dog-friendly. This morning we headed a few miles up the coast to Craster and did a walk that we’ve done before, north along the coast past the atmospheric remains of Dunstanburgh castle, on to Embleton Bay and then turning inland to return to Craster. I usually do quite a lot of cooking on holiday and today we headed back after our walk to have lunch at our cottage. 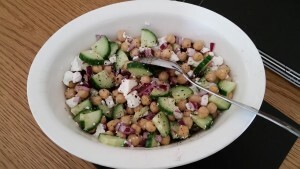 Today it was one of our regular summer lunchtime dishes, an easy chickpea salad with feta, red onion and cucumber. It’s very quick and simple but very tasty and I like having a few tried and tested bean salad recipes in my repertoire. They’re so satisfying and healthy. Put the first 4 ingredients into a serving dish. Add the juice of 1/2 a lemon (about 1 tablespoon) and 1 tbsp of olive oil. Stir together carefully so you don't mush the feta cheese. Finish with a good grind of fresh black pepper. This is good served with crusty bread and butter.